Starlight, starbright.... 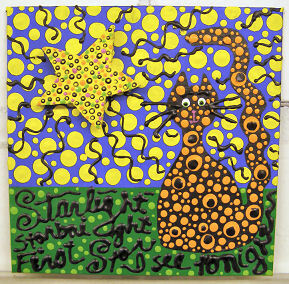 This little kittie is wishing upon the most outrageous star you've ever seen. This is an original painting, and not a print. It's created on a 8 x 8 inch canvas board using professional quality acrylic paints. A whimsical polka-dotted wood star hangs in the sky for all to see. There's also a lot of detail and dimension that's challenging to capture in a photo.